Six Lewis Chessmen are to be displayed long-term at a new museum on the Western Isles, where more than 90 of the historic pieces were found. An agreement has been reached between Comhairle nan Eilean Siar (Western Isles Council) and the British Museum. The British Museum will loan the six pieces to the new museum at Lews Castle, in Stornoway, from 2014. Figures from the Lewis Chessmen have only previously been displayed on the islands on a short-term basis. 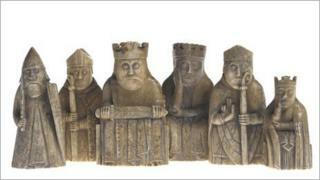 A five-month exhibition last year, called Lewis Chessmen: Unmasked, attracted more than 23,000 visitors. Under the new arrangement, six pieces will go on show on a more permanent basis at the 19th Century Lews Castle following the completion of a major revamp of the building. Archie Campbell, chairman of the comhairle's sustainable development, said the display would be a major attraction. He said: "These amazing little pieces will undoubtedly attract new visitors to the islands and once they are here visitors will find there is a lot more to see, enjoy and learn. "Heritage is one of our most important assets and will make an increasing contribution to the economy of the islands." Angus Campbell, leader of the comhairle, said it was "highly appropriate" some of the chessmen would return to Lewis. British Museum director Neil Macgregor said he was delighted with the partnership with Western Isles Council. He added: "The British Museum is committed to lending its world collection and to working with partners across the UK to share objects and expertise for the benefit of the widest possible audience."